With my first vacation to Nashville, I packed a lot of fun pieces to embrace the spring season in style. Of course, I shopped on a budget! I found plenty in Target to bring along with me. Kimonos are something I wore ALL the time a few years back, and they are trending right now. 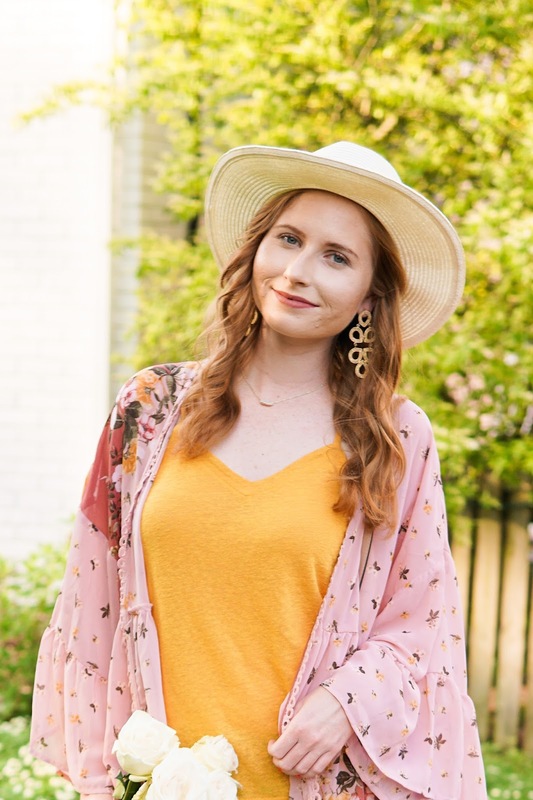 Keep reading to find out more about this entire look as I style a pretty pink kimono over a casual mustard-colored tank while on vacation in the Music City! Doesn't this floral boho printed kimono remind you of something similar sold at Anthropologie!? However, this KIMONO is onlyyyy $22 bucks! What a steal. I saw the kimono in the corner of my eye -- the delicate mix of florals and light blush caught my attention for sure! I'll go for anything pink at the moment. While browsing Target looking for new things to bring on my trip I chose to buy this kimono to wear while on vacation in Nashville the following week. I am wearing a size small, and the fit was SO loose and flowy, I loved wearing it with a mustard tank. As for my crossbody bag, I indulged in a Tory Burch purse for spring this year! Just in time for my Nashville trip, my new bag arrived at my doorstep. The buttery sand tone of this crossbody bag compliments all of my favorite things to wear in the springtime. From floral pieces to jeans and a tee, I've already used my sand-colored Tory Burch Mcgraw Camera Bag with a ton of outfits. The camera bag has plenty of room for my gigantic phone and wallet, which I was hesitant about when I first purchased it online. Buying purses on the Internet can be tricky because you just don't know how wide they will be in person! Also, I'm thankful for our Airbnb host for leaving some gorgeous white roses on our kitchen table this past week. These roses became such a lovely added touch and photo prop to use! My Nashville tips and tricks post outlined exactly how the entire trip looked, too! I would highly recommend browsing through Airbnb until you find an adorable place to rent for the duration of your stay. SHOP MY LOOK! CLICK THE ITEMS FOR EXACT LINKS!